If you’re missing one or more teeth, it’s very likely that you don’t look or feel your best. Missing one or more teeth can make it difficult to chew thoroughly and speak clearly, potentially impacting the quality of your social life. Over time, the shape of your face may begin to change as well, as gum tissue recedes and provides less support to your facial structure. Empty sockets left by missing teeth also allow the surrounding teeth to move, causing teeth to become crooked or irregularly spaced. But guess what- it doesn’t have to be this way. Call Dr. Danny Nakhla at Independence Family Dentistry to schedule a tooth replacement consultation today. At Independence Family Dentistry, we encourage our patients to know and understand all of their treatment options before making a decision. Not every patient is a good candidate for dental implants, and you may be better suited to undergo one of our other more traditional tooth replacement options. 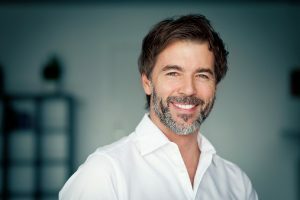 Before considering the many benefits of dental implants, you should be aware of more traditional tooth replacement options available in our office. For patients missing 1 to 3 consecutive teeth, crown and bridge therapy is typically recommended. Crown and bridge therapy consists of a “bridge” tooth or teeth that fill gaps left by missing teeth. They are supported by anchoring crowns affixed to teeth on either side of the gap. For patients missing 3 or more teeth, either a full or partial denture will be recommended depending on the number of missing teeth and the condition of remaining teeth. 1. Maintain Gum Tissue and Bone Density – Because dental implants replace the whole tooth starting with the root, they help to stimulate the jawbone and support gum tissue so you maintain bone density and facial shape. A titanium post implanted below the gums provides support for your dental prosthesis by mimicking the root of your missing tooth. Dental implants are the only tooth replacement option that will continue to support bone density and gum tissue. 2. Offer a permanent solution – Unlike other tooth replacement options, with proper maintenance, implant supported replacement teeth could last a lifetime. They are anchored to your jawbone with titanium posts, and attached by Dr. Nakhla on a later visit after your implant posts have an opportunity to heal. Once the permanent dental prosthetic is placed, it functions just like your natural teeth. No taking it out to clean at night, or having the appliance reshaped every few years to fit your receding gums. 3. Looks and feel like natural teeth – Your implant supported tooth replacement will look and feel more like natura­l teeth. Because the replacement teeth are anchored to implants that replace the root, you can enjoy the foods that you love, speak confidently never fearing your teeth will slip and slide or your speech will be impeded, and knowing that your new teeth look as good as they feel. No matter how many teeth you’re missing, Dr. Nakhla and the team at Independence Family Dentistry are here to help you find the right replacement option to fit your tooth replacement needs. If you’ve never considered dental implants, now’s the time to find out more about implant supported tooth replacement and how it can transform your life. Our Independence, KY office welcomes patients from throughout the Northern Kentucky and Cincinnati area.